Get ready to meet Thomas Mulcair all over again. With a media vortex and public love-in swirling around Justin Trudeau, the NDP is about to unveil its leader in a new — and contrasting — light, at the party’s policy convention in Montreal this weekend. Key to the image makeover is a new video to be unveiled Friday that features Mulcair’s personal side and, for the first time, introduces Canadians to his immediate family. Nathan Rotman, the party’s national director, said the NDP has had trouble getting Mulcair known since he was elected party leader in March 2012, following the death of former leader Jack Layton. Between this year’s federal Liberal leadership race, several provincial leadership contests and imminent provincial elections in Ontario and British Columbia, it has been tough for Mulcair to present himself as the statesman-in-waiting that the NDP wants to project. “People got to know Jack (Layton) over 10 years. We don’t have as much time to introduce Tom to Canada before the next election — and the stakes are too high this time for us,” Rotman told HuffPost. Mulcair, who is better known as a policy wonk and a streetfighter with a temper, will be featured in a much more positive light: warm, loving and loved. “I don’t think it’s about showing a different face, it’s about showing the other side of him,” Rotman said. Mulcair was born in Ottawa but grew up north of Montreal, the second eldest child in a family of 10. His English-speaking father, an Irish man named Harry, worked for an insurance company, while his French-Canadian mother, Jeanne, was a school teacher. A screengrab photo of Mulcair and his immediate family from the video to be shown Friday at the NDP policy convention. The video includes a clip of Mulcair’s sister, Deborah, who lives in B.C., speaking about her close relationship with her brother, who both mentored her and helped raise many of their younger siblings. Also featured are Mulcair’s two sons: Greg, 31, an aerospace engineer who teaches physics and engineering technologies at John Abbott College outside Montreal; and Matthew, 36, a sergeant in the Sûreté du Québec (Quebec’s provincial police) who is married to Jasmyne Côté, an elementary school teacher with whom he has a three-year-old daughter, Juliette. The presentation, the NDP says, will show Mulcair as a strong progressive, a passionate champion of women's rights when he was head of the Office des professions du Québec fighting for patients who were alleging sexual harassment by doctors, and a principled leader who quit then-Liberal premier Jean Charest’s cabinet when he was environment minister over a proposed condo development in the Mont Orford provincial park. (Provincial Liberals, however, suggest the Mont Orford development is a convenient excuse for Mulcair, who they say quit over Charest’s plan to demote him in cabinet). 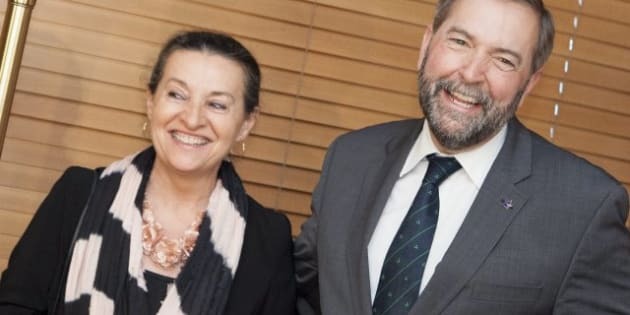 On Saturday, after Mulcair’s leadership review, he will be introduced by his wife, Catherine Pinhas, a psychologist who was born in France, the daughter of a Sephardic Jewish couple with Turkish roots who survived the Holocaust. Mulcair will also take part in a town hall Friday, which officials say will be “unscripted and without notes,” but the questions will be pre-selected from Twitter, Facebook and the NDP’s website. Carleton University political scientist Bruce Hicks said it is in the NDP’s interest to try to define Mulcair before his opponents define him. But that can backfire if they present him as something he is not and it “doesn’t wash” with the public, he said. “Mulcair was always a politician who was a little too bombastic when it came to his claims and his outrage, and they certainly need to tone that down if they want to present him not as a leader of the opposition but as a prime minister,” Hicks said. Hicks said it is also smart of the NDP to want to highlight Mulcair’s childhood and family background and contrast it with Trudeau, “who lived well and had the security blanket of a trust fund,” because a politician’s personal narrative does help move votes. While the NDP hopes the contrasts with Trudeau, whom they view as flaky, inexperienced and untested, will be readily apparent, the party is officially taking a wait-and-see approach. “It’s too soon to know what Justin’s leadership will look like,” Rotman said. “Liberals have traditionally campaigned on the left but governed on the right, and I don’t believe that their new leader will be much different,” said Rotman, noting Trudeau has offered very few of his own views on policy. Several top New Democrats told HuffPost that this weekend's convention will reveal whether the party’s membership is ready to accept the challenge of governing. In 2008, when Layton told reporters he was campaigning to become prime minister, few took him seriously. Now, the party believes it has a real chance of forming government in 2015 — if it can convince Canadians the party is ready for the responsibility. The first task, Rotman suggested, is highlighting to the party’s membership the importance of winning. “We need to bring our people along and say, here are some of the great things we can do (if we have power),” he said. For a long time, many New Democrats were content with being the “conscience of Parliament,” he said. “We are still the voice of principle — I don’t want to make it sound like those principles alter — but you need to think about how you govern for all Canadians. You need to think about what happens when disaster strikes, when the economy goes south, when the economy goes north and how we can build a strong sustainable economy, and how we can support small businesses, and what a Canadian New Democrat government will look like,” Rotman said. Provincial NDP leaders such as Nova Scotia Premier Darrell Dexter and Ontario’s Andrea Horwath, who has a good chance of becoming the next premier of Ontario, will be brought in to help make the NDP’s case, as will Manitoba Premier Greg Selinger and B.C.’s Adrian Dix, another potential premier, who will join via video-conference. The NDP will also spend Saturday focused on convincing the public that its surprising landslide win in Quebec during the last election was not a fluke but rather the result of years of hard work and planning. “No one has hidden the fact — you couldn’t hide the fact — that some MPs did not campaign hard and were elected in Quebec in 2011,” Rotman acknowledged. But those MPs, he said, are now working hard. Through a 45-minute presentation of speeches and videos, people will realize that NDP’s Quebec victory “wasn’t just a blip” and that it could be replicated, Rotman said. The showcase will trace the progression of Canada’s NDP in Quebec since 1961 — from David Lewis’s dream of expanding the party in the province, to Ed Broadbent’s first win with Phil Edmonston in a 1990 byelection, to efforts of many young progressives, such as Karl Bélanger, Mulcair’s current principal secretary, to the roadmap laid out by Jack Layton in his leadership bid in 2003. Organizers expect 2,000 people to attend the NDP’s three-day convention. And while some controversial policy proposals from the party’s grassroots have already been weeded out, and several others are expected to be debated and cast aside behind closed doors on Friday, most of the media’s attention will focus around one proposal on Sunday that aims to update the preamble to the NDP’s constitution by softening language around socialism. Party brass had tried to scrap the words “democratic socialism” from the preamble at the NDP’s last convention in Vancouver, in June 2011, but a fiery debate emerged on the convention floor. Then-party president Brian Topp decided to park the issue until the next policy convention. In an unforgettable exchange, Winnipeg MP Pat Martin urged delegates to vote in favour of the proposed change, saying at the time that the socialist label was like an “anchor fouled up on the rusted hull of some old ship that sank in the last century” and was holding the party back from forming "a modern, progressive, majority, social democratic government." The new proposed preamble, drafted by a group of people chosen by the party executive and including former leader Alexa McDonough and longtime MP Bill Blaikie, doesn’t eliminate the word “socialist” but does tone down the rhetoric. It affirms that New Democrats are people who share social democratic and democratic socialist traditions, and who have worked together through different labour, farming, co-operative, feminist, human rights and environmental movements towards the same goal: to build a more just, equal and sustainable Canada.